Mississinewa 1812 is an event in our area that we attend almost every year. In fact – at the bottom of this post I have links to pages that I have made for this event during other years. When we arrived we discovered that much of the reenacting was not a reenactment of the Battle of 1812, as much as a display of the different kind of troops from various areas and Nations that were involved in the Battle of 1812 all around the country. This didn’t matter too much to us as the whole experience was informing, exciting, and delicious! 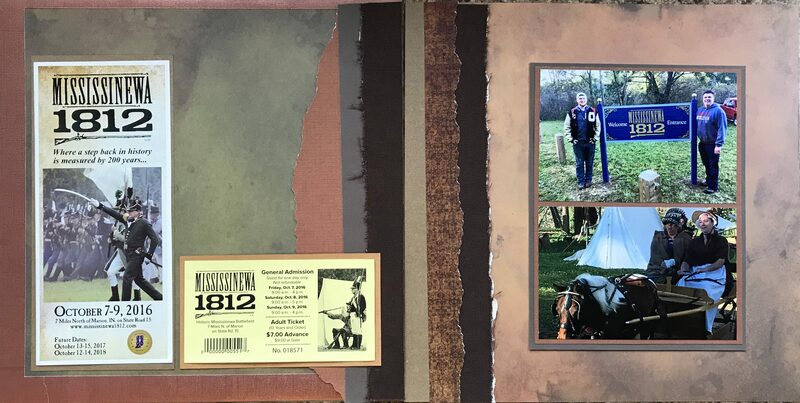 I chose a vintage theme for this page and used an ornamental corner punch to cut the frames for the photos on both page. I used a different corner punch to cut the inside corners of the photos on the left hand page to make for an interesting pattern in the middle. I used my Cricut machine to create the Date Title, and allowed the top left picture to announce what the location/event was. Behind the pictures on the right hand page are 3 pieces of ephemera that we got at the event. One is a bag that hand some candy in it (top right). In the bottom left of the right hand page is a burlap piece that is used to play domino games, and behind all of them is a burlap chess board that can be rolled up to easily carry. These last two items where given to my son by a kind reenactor gentleman who was sitting outside of his tent entertaining kids.